When you travel, you will like to share your great discovery, scenic spots, and wonderful moments meeting people with your family and friends right then and there through social media like Facebook, Twitter, flicker, etc. What if you can’t find a Wifi spot? Your Japan Wifi will easily solve the problem! Internet access anywhere (in trains, at cafes, etc) by your computer or smartphone is always possible with the Pocket Wifi. *You can pick up Pocket Wifi within 14 business days before your Australia departure date. Customer shall care for and use the rental device for its intended purpose according to the instructions provided by us. The communication fee by third parties who arose on the occasions such as a theft shall have the duty of payment to customer. Even if device carried out such as a theft are discovered/recovered after (after settling accounts with a specification card) issue a bill from us, device price shall not return. A Fair usage policy(FUP) applies to Japan Pocket Wifi and is governed by the ISP in your service area, these are put in place to ensure all users of an ISPüfs network receive a reasonable level of service as advertised. If the ISP decides to enforce their FUP, the ISP may do all or any of the following: Limit usage time frames, restrict data usage, restrict speed or access to certain services. Please refrain from downloading massive amount of data, streaming movies/videos, playing online games, etc. If you continue to use excessive amount of data, Sachi Tours will not be responsible for any problems accessing the internet or any other restrictions put in place by the ISP. Should you continue to use excessive amounts of data you will be responsible for any excess charges incurred as a result. The nature and conditions of the signal will change from hour and hour. It will become difficult to use when the signal conditions are weak or disrupted. Signal conditions are subject to change frequently. Abnormal operation of the device may be experienced should the signal become weak or disrupted, this can be caused due to a number of factors at your location such as weather, buildings or interference from other devices. 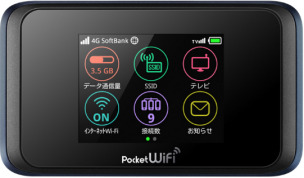 Please note that Pocket Wifi device support a maximum of 10 devices, when running at full connection capacity a drop in connection speed may be experienced. Even with best effort delivery, you may experience slower speeds or connection loss depending on network conditions and traffic volume. NTA/Sachi Tours draws on 112 years in Japan and 30 years of experience in Australia, over 2,800 trained employees, 286 branches within Japan and 37 group companies throughout the world to offer the utmost satisfaction to you. We promise prompt, efficient, worry free service, supported by our computerized system. Whether you desire total planning or limited assistance during your trip to Japan, we consider you our guest in Japan and extends to you the courtesy we value highly.